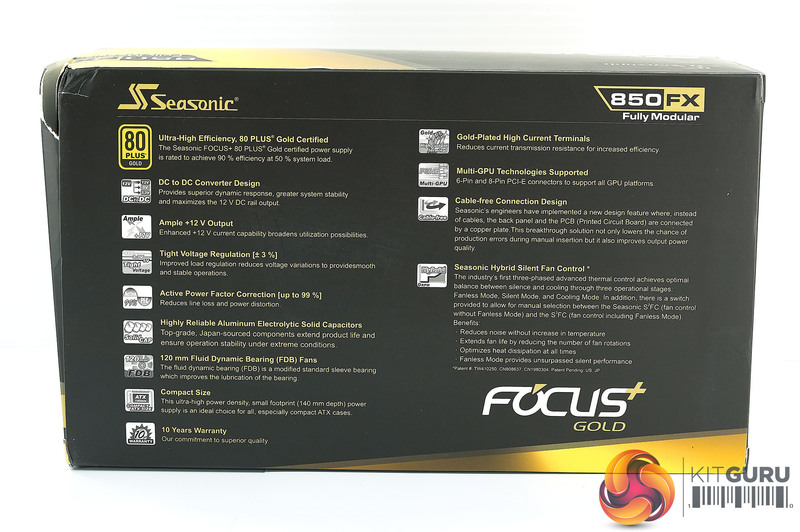 The Seasonic FOCUS PLUS Gold box is very bright and eye catching. I had to find my sunglasses for the photography. 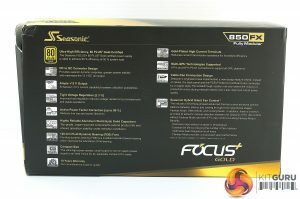 The rear of the box lists specifications and various features of the supply. Inside on top is a user manual, some cable ties, mounting screws and a FOCUS Sticker. 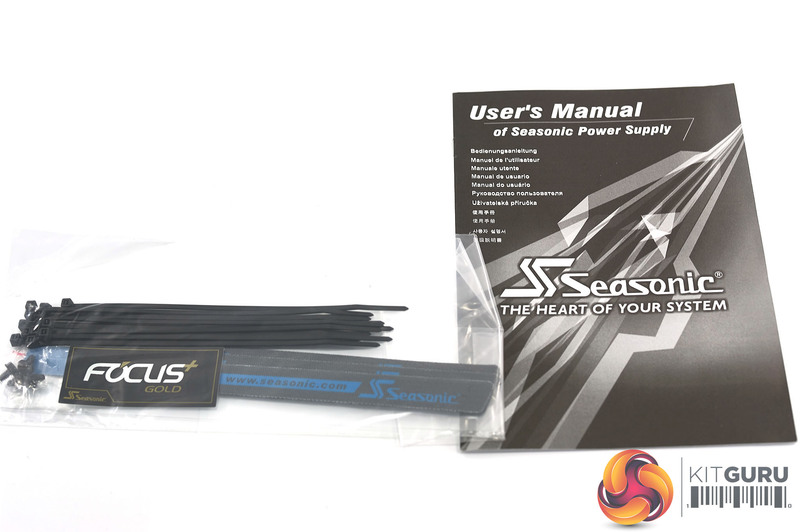 Seasonic also supply a regional power cable. 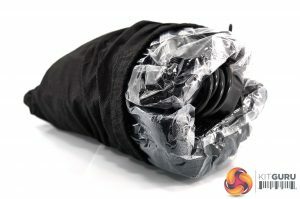 The modular cables are supplied inside a soft felt bag, as shown above. 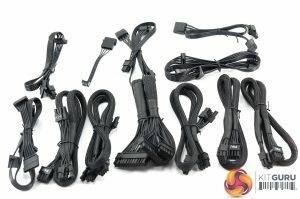 You can use this to store any left over cables as well. 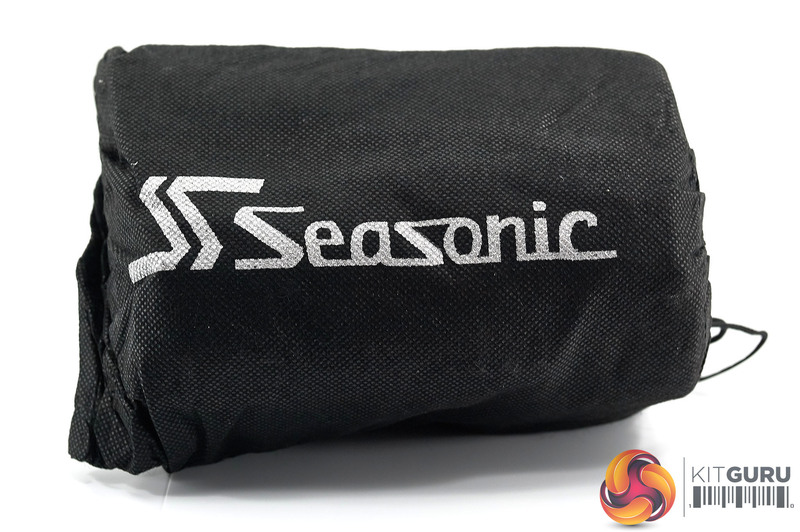 Seasonic use a mixture of sleeved and flat ribbon style cabling as shown in the image above. 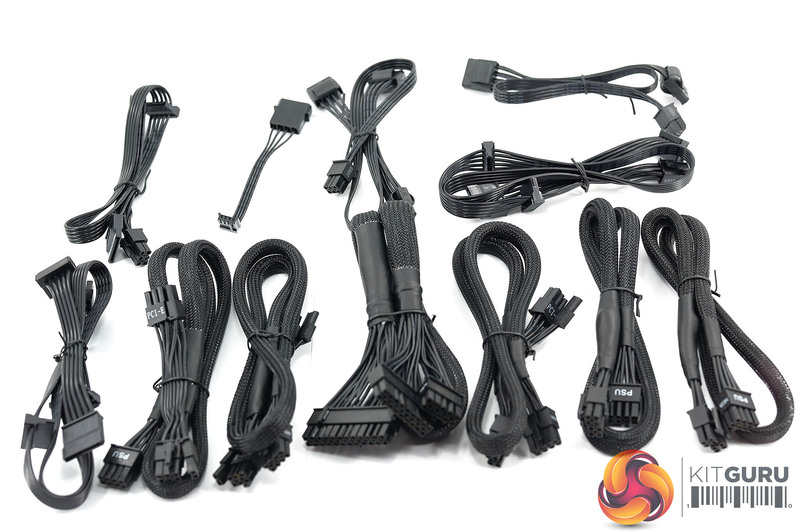 There are plenty of PCIe power cables to handle beefy SLI and Crossfire gaming systems. 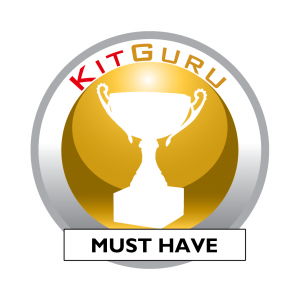 There are also 10 SATA connectors included to cater for enthusiast users with plenty of hard drives and Solid State Drives. 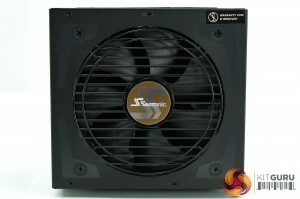 The Seasonic Focus Plus 850W power supply is painted matte black and measures only 140mm deep. 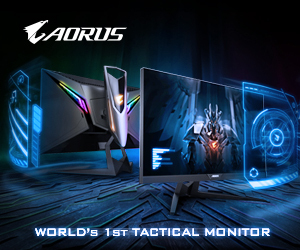 Regular readers will notice that the outer chassis is very different in design than other PRIME units we have reviewed in the last year. 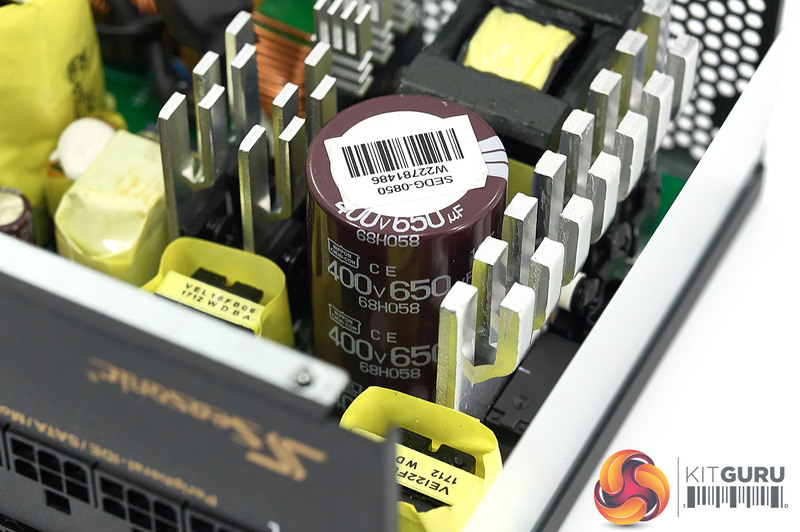 Build quality is at a similar level to the higher cost units in the Seasonic range – which is very reassuring to see. Paintwork is quite deep and pretty resistant to scratching as well. The modular bay is cleanly laid out and labelled for ease of install. 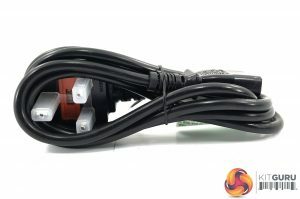 No chance of mixing up Peripheral and PCI-E connectors as they are different pin configurations (CPU-PCI/E is 4+4 and Peripheral is 3+3). 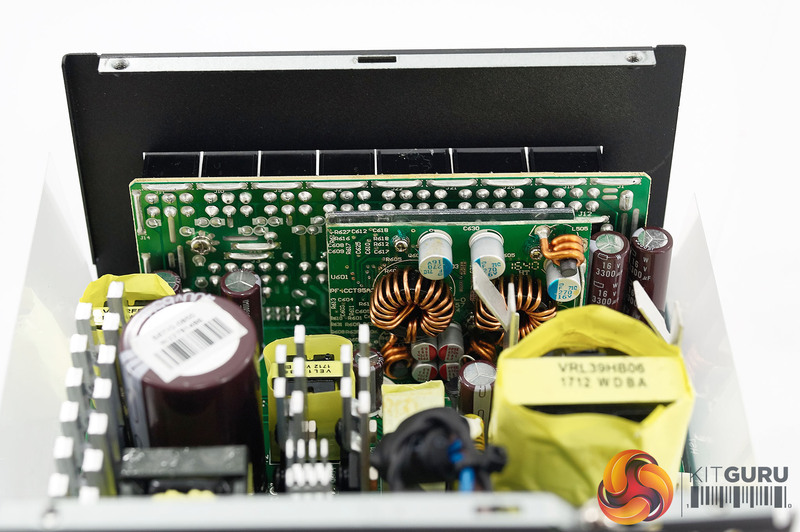 The other side of the chassis is home to the power cable connector, power switch and Hybrid mode switch which offers semi fanless mode when enabled. 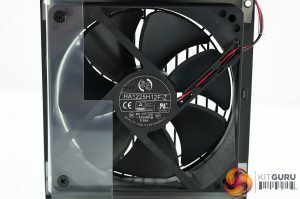 The rest of the panel is honeycomb vented to help with air flow. 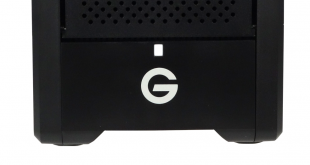 The fan guard is a straight metal grill with Seasonic branding in the middle. 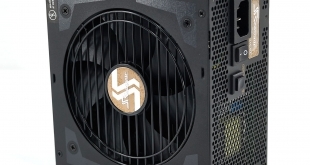 Seasonic are using a large 120mm fan, and we will get a closer look at this when we open the chassis later in the review. 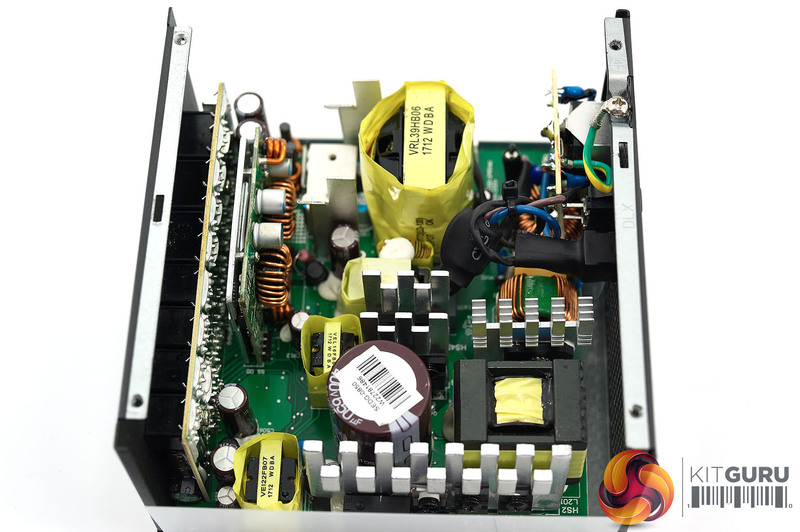 The power supply has a 12V output up to 70A, which is around 98.8% of the units total capacity. 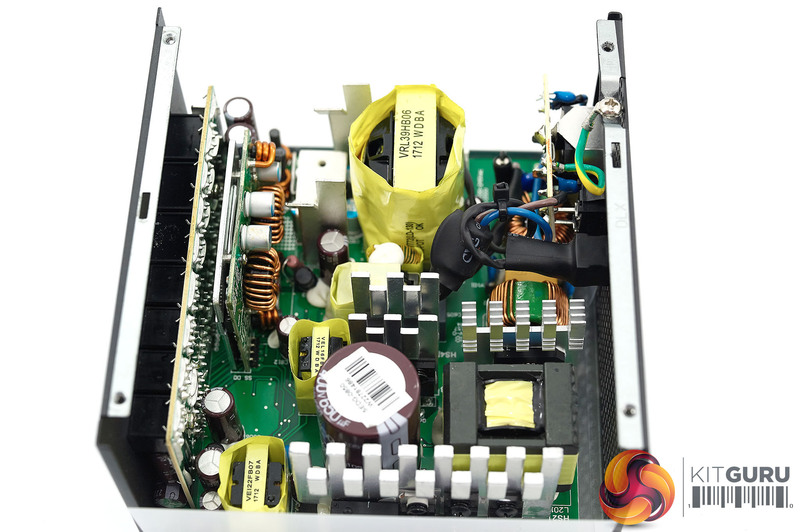 Each of the minor rails (3.3V and 5V) have a capacity of 20A with a combined rail output of 100 Watts. 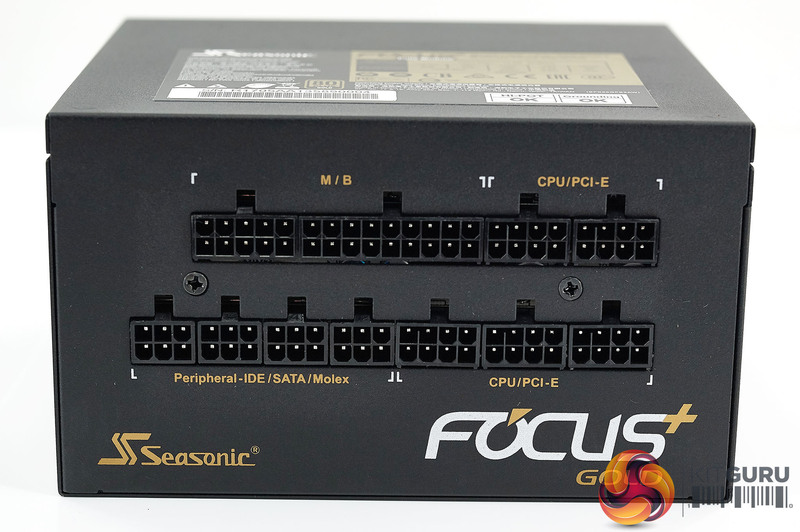 This is a fairly standardised set of figures from Seasonic based on all of the 850 Watt units I have reviewed from them in recent years. Seasonic are using a high grade Hong Hua fan (Model: HA1225H12F-Z). This unit is built around a Fluid Dynamic Bearing for quiet operation and long life. 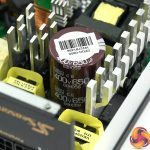 It is rated 0.58A, at 12 VDC. 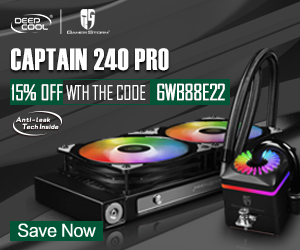 Maximum speed is rated at 2,200rpm, producing 73.9CFM at 32.4dBa. 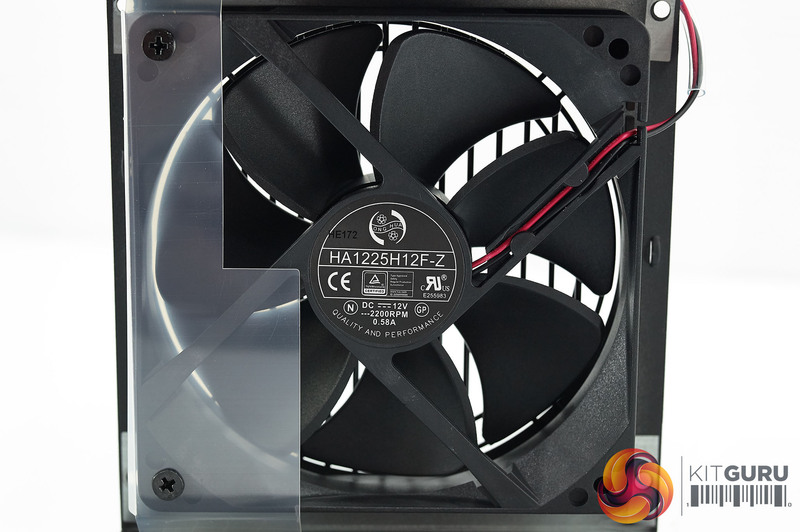 You will notice the unusually cut plastic cover along the left side of the fan – this is to direct the air flow at specific parts of the power supply underneath. 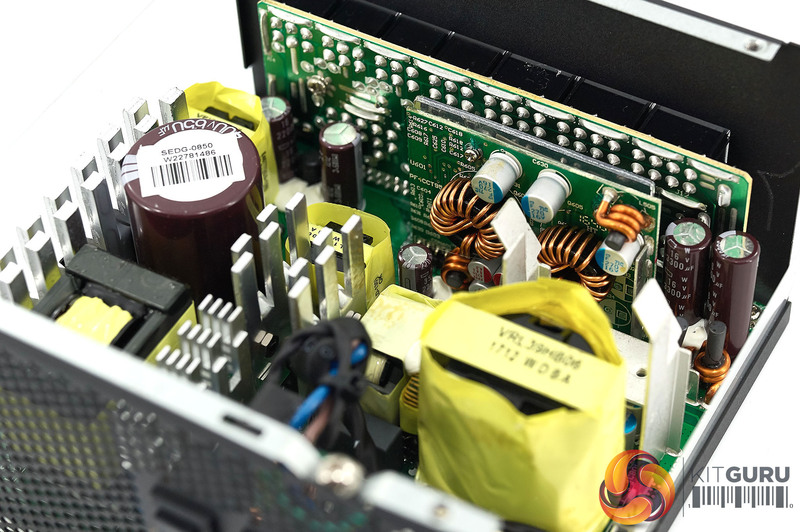 Soldering quality throughout is excellent as we would expect from Seasonic. Very clean job indeed. This is a new platform. 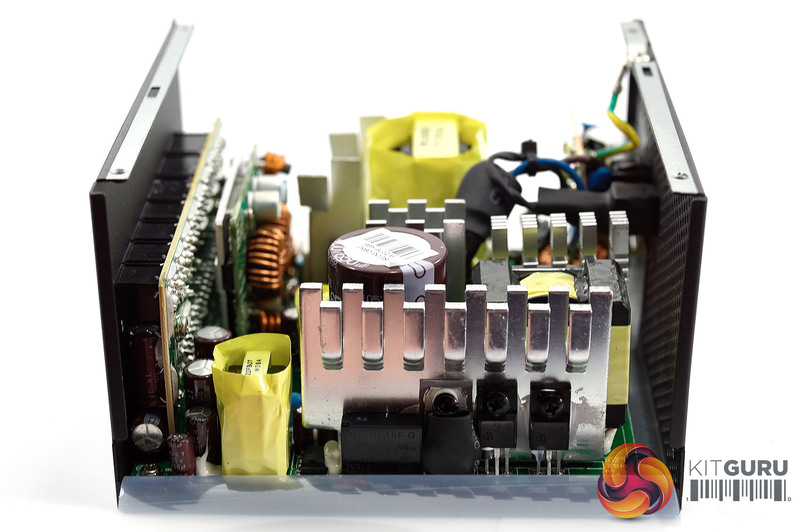 Inside are a fair few smallish heatsinks to aid with cooling key components. 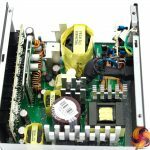 The power supply is using a full bridge LLC topology with synchronous rectification with DC-DC VRM’s for +3.3V and +5V rails on secondary. 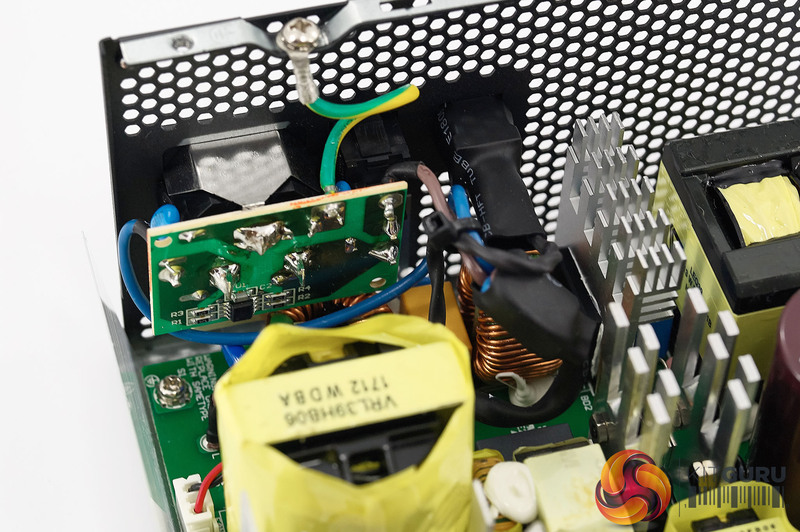 Input filtering starts on a small PCB with Y and X capacitors in place – moving to the main PCB for completion. 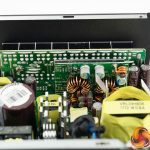 Seasonic are using high grade Japanese capacitors throughout the build with a single 105c rated Nippon Chemi Con positioned in the primary stage. This is rated 400v 650uF. 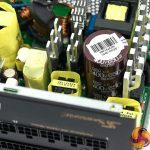 Interestingly Seasonic have adopted two primary capacitors in their earlier higher cost PRIME units. 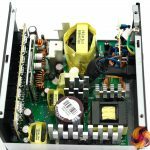 The Prime 850W Platinum for instance uses two Nippon Chemi Con capacitors at 400v 330uF each, for a total of 660uF output. 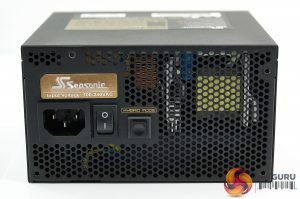 The Seasonic Titanium 850W unit is ridiculously over specified – fitted with two Nippon Chemi Con 650uF and 450uF capacitors to output 1100uF! 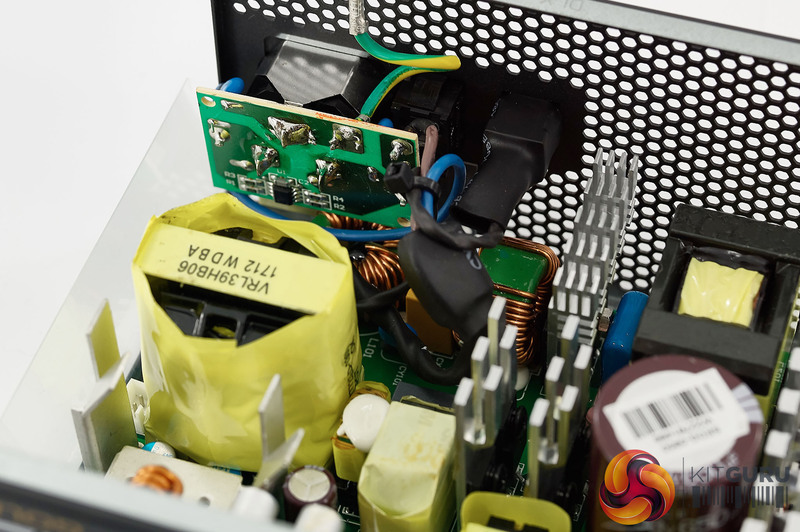 In the secondary stage are a mixture of solid and standard electrolytics from Nippon Chemi Con. 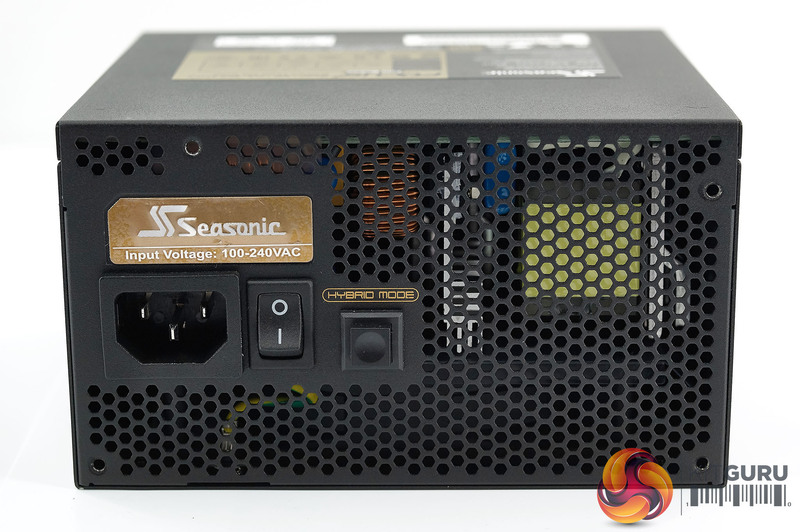 Full marks to Seasonic for their work in this new platform. 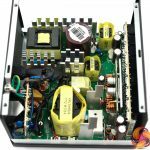 We managed to get the power supply to deliver 910W before it would shut down, delivering around 60W more than rated specifications. 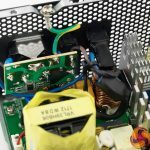 The power supply dealt with the demanding cross load test very well exhibiting only minor fluctuation. 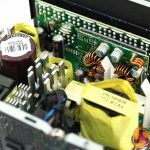 It was tasked with 60A on the +12V rail and it held at 11.95V. The other rails delivered good results also. Efficiency is very good, peaking at 92.3 percent at 50 percent load. 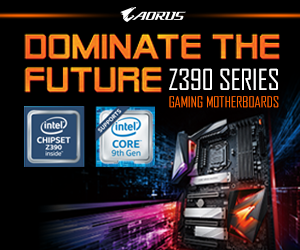 This drops to around 90.4 percent at full load. 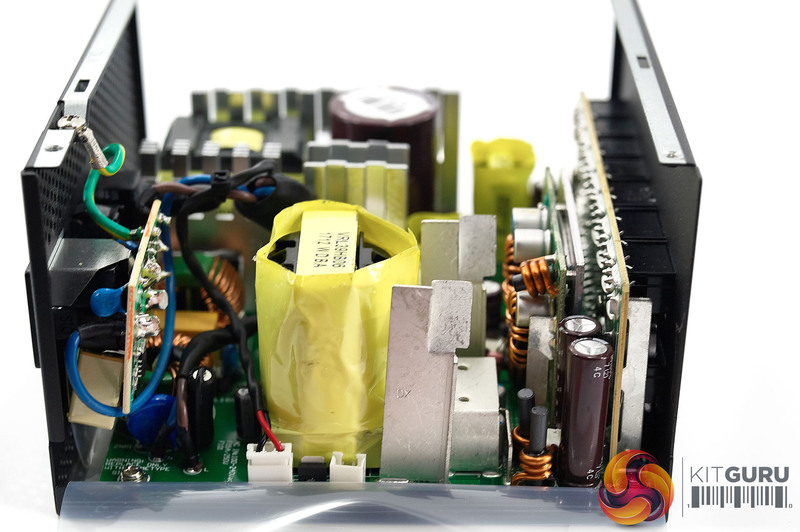 At 910 watts, the efficiency level measures 90.0%. Not a practical situation to be running 24/7, but worth noting. 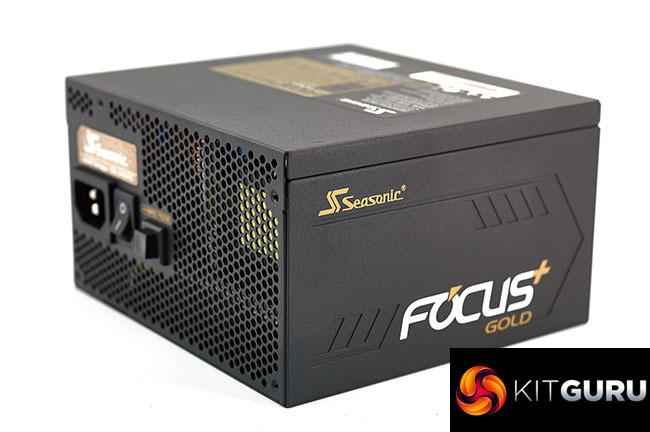 The Seasonic FOCUS PLUS Gold 850W is yet another power supply in the company line up to deliver, quality, high grade power to a demanding enthusiast system. The build quality is fantastic, and there are no indications that Seasonic have cut any manufacturing corners to hit a more competitive price point in the mid range market. The external paint work is stellar, and the overall look will fit in many builds without ruining the overall appearance. 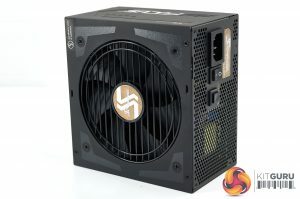 It is without question a very well built power supply to solidify the companies standing in the enthusiast sector. The FOCUS PLUS Gold is a new design from Seasonic and it has been admirably executed. 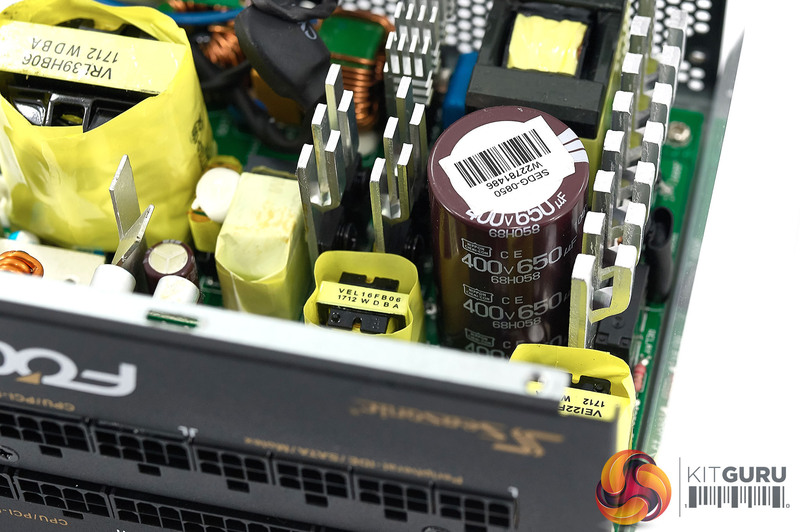 These power supplies are set to replace the S12G and G units which have been around now for a long time. 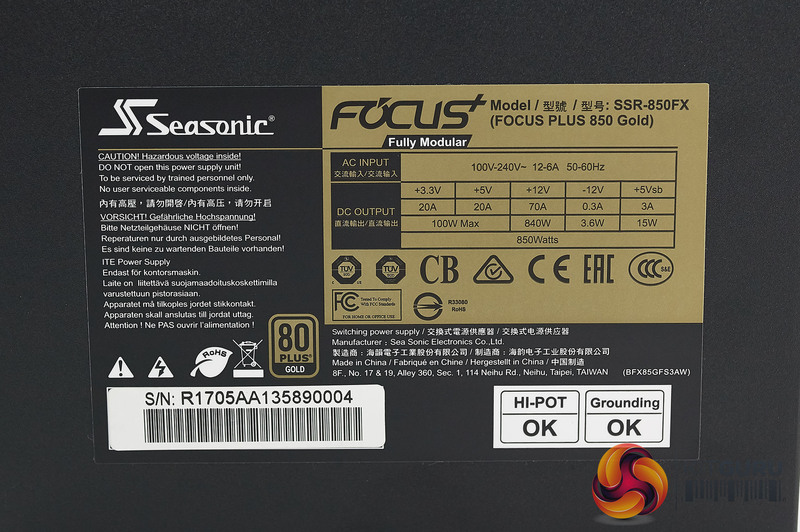 The FOCUS PLUS gets a high recommendation from us, and with the 10 year Seasonic warranty – there is plenty of peace of mind for now and far into the future. Technically, the FOCUS PLUS Gold is rock solid. 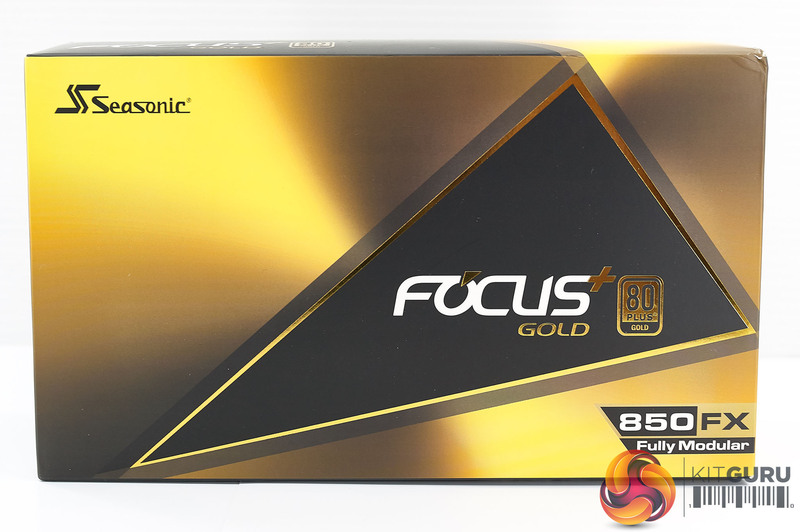 Noise suppression is worthy of another mention, and the efficiency levels are high, easily achieving 80 Plus Gold certification. 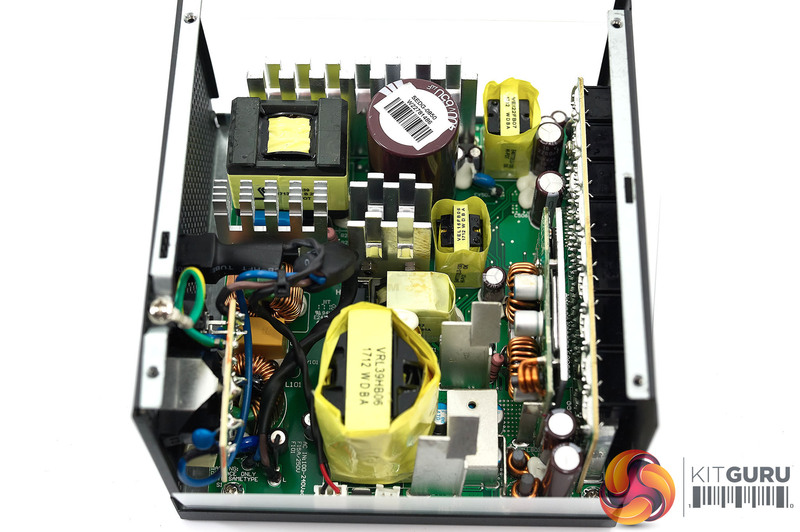 Voltage regulation is another plus point – without any hitches in the delivery we can mention. As always. 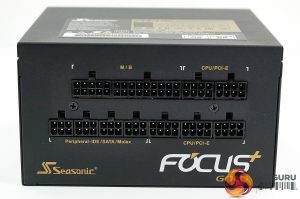 the Seasonic modular cabling is top drawer although we would imagine a specific audience would prefer Seasonic to ditch the fatter sleeved cables on the PCIe and CPU cables to universally focus on flat ribbon style cables. 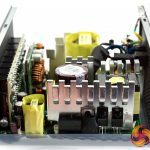 The power supply in operation is very quiet. Seasonic have improved their fan selection in recent years, and the latest Hong Hua Fluid Dynamic bearing fan adopted in this 850W unit is very quiet unless you are constantly demanding in excess of 750 watts. 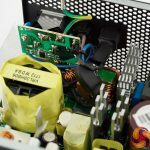 If so, you would be better investing a little more cash on a 1000 watt unit as it would put less stress on the capacitors and reduce overall noise levels. The Seasonic PRIME 1000W Platinum unit (or Titanium if you can afford it) would be one of my first choices for this kind of load situation. 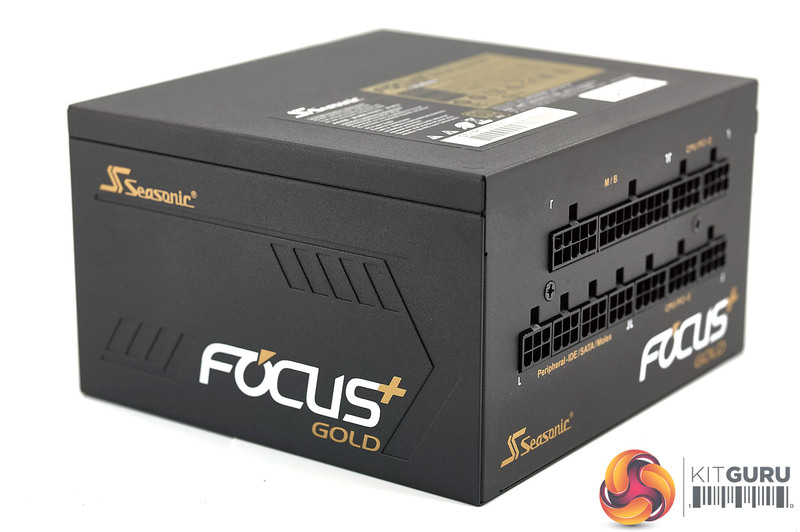 Buy the Seasonic FOCUS PLUS Gold (FX) 850W power supply from Overclockers UK for £124.99 inc Vat HERE. 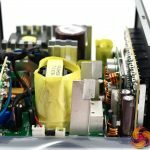 High grade Nippon Chemi Con capacitors used throughout. 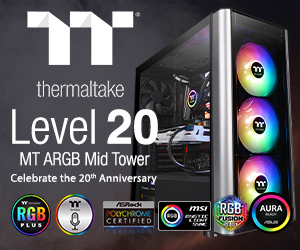 achieved 80 Plus Gold in our tests. 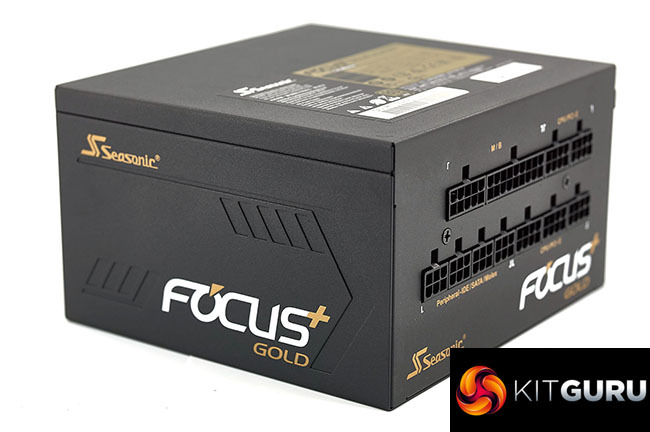 KItGuru says: The Seasonic FOCUS PLUS Gold 850W supply is technically robust and its built to the very highest standards. We rate it very highly indeed.